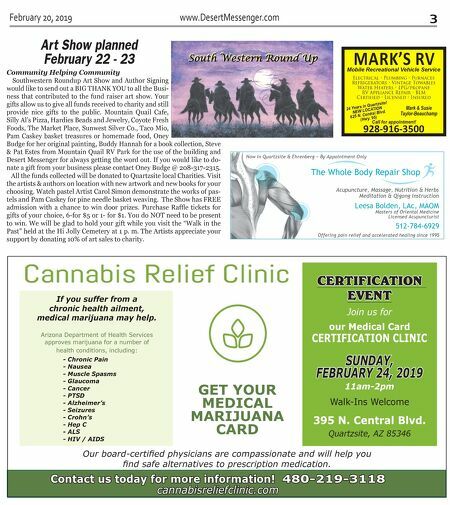 2 www.DesertMessenger.com February 20, 2019 "ADDICTED TO DEALS" "ADDICTED TO DEALS" LLC Call Monte or Ann Quartzsite Store: 928-927-3325 or 928-642-7543, CELL AddictedToDeals@AOL.com AddictedToDeals.com BUY ONE GET ONE FREE* EMU OIL! 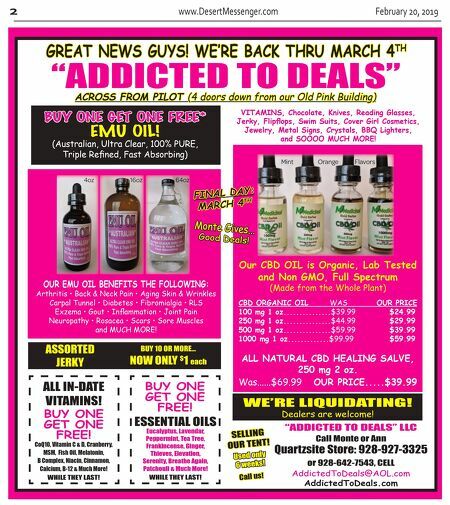 (Australian, Ultra Clear, 100% PURE, Triple Refined, Fast Absorbing) OUR EMU OIL BENEFITS THE FOLLOWING: Arthritis • Back & Neck Pain • Aging Skin & Wrinkles Carpal Tunnel • Diabetes • Fibromialgia • RLS Exzema • Gout • Inflammation • Joint Pain Neuropathy • Rosacea • Scars • Sore Muscles and MUCH MORE! ACROSS FROM PILOT (4 doors down from our Old Pink Building ) Our CBD OIL is Organic, Lab Tested and Non GMO, Full Spectrum (Made from the Whole Plant) CBD ORGANIC OIL WAS OUR PRICE 100 mg 1 oz...............$39.99 $24.99 250 mg 1 oz...............$44.99 $29.99 500 mg 1 oz...............$59.99 $39.99 1000 mg 1 oz.............$99.99 $59.99 ALL NATURAL CBD HEALING SALVE, 250 mg 2 oz. Was......$69.99 OUR PRICE.....$39.99 ALL IN-DATE VITAMINS! BUY ONE GET ONE FREE! CoQ10, Vitamin C & D, Cranberry, MSM, Fish Oil, Melatonin, B Complex, Niacin, Cinnamon, Calcium, B-12 & Much More! WHILE THEY LAST! BUY ONE GET ONE FREE! ESSENTIAL OILS Eucalyptus, Lavendar, Peppermint, Tea Tree, Frankincense, Ginger, Thieves, Elevation, Serenity, Breathe Again, Patchouli & Much More! WHILE THEY LAST! VITAMINS, Chocolate, Knives, Reading Glasses, Jerky, Flipflops, Swim Suits, Cover Girl Cosmetics, Jewelry, Metal Signs, Crystals, BBQ Lighters, and SOOOO MUCH MORE! GREAT NEWS GU Y S! WE‛RE BACK THRU MARCH 4 TH FINAL DAY: MARCH 4 TH ASSORTED JERKY BUY 10 OR MORE... NOW ONLY $ 1 each WE'RE LIQUIDATING! Dealers are welcome! Monte Gives... Good Deals! SELLING OUR TENT! Used only 6 weeks! Call us!